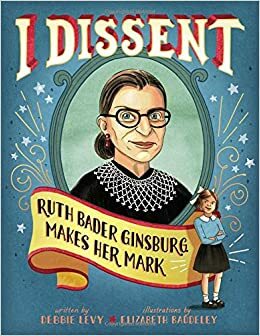 Written by Debbie Levy and illustrated by Elizabeth Baddeley, I Dissent: Ruth Bader Ginsburg Makes Her Mark (2016), is a deeply layered children’s picture book that tells a uniquely American story through the biography of Supreme Court Justice Ruth Bader Ginsburg. Instead of suggesting young girls should smile demurely it treats disagreeing intelligently and passionately as a moral imperative. After introducing young readers to the text’s protagonist we’re swept back in time to 1940’s Brooklyn, a culturally rich neighborhood where, regardless of religion or ethnicity, one idea could be taken for granted: “Boys were expected to grow up, go out in the world, and do big things. Girls? Girls were expected to find husbands.” Big bold typography assures the reader that “Ruth’s mother disagreed.” Ginsburg’s mother filled her hands with books and her head with ideas about the world. The world of books, where young Ginsburg’s imagination could run wild, stood in stark relief to the US in the 1940s. With the turn of a page we travel with Ginsburg’s Jewish family on a road trip through Pennsylvania where they are confronted with signs, silently bellowing: “No Dogs or Jews,” “No Colored,” and “Whites Only.” Young Ginsburg disagreed with the signs, felt “the stings of prejudice,” and was motivated to demand change. Ginsburg began protesting indignities young. In one two page spread a bright blue-eyed Ginsburg protested receiving a D in penmanship after a teacher forced the left-handed girl to write with her right hand. She eventually refused to comply with her teacher’s unmotivated demand, and ended up demonstrating “quite nice handwriting.” The lesson of respectful self-advocacy, even if it entails rule breaking, is far more useful than docile obedience. Sometimes being good requires misbehaving. Levy foregrounds this in her homage to Ginsburg. Of course, Ginsburg’s objections were not always well received. For instance, she wanted to take shop with the boys but was forced to take home economics, a subject she never mastered. (Although her future husband did). Ginsburg learned other hard lessons, including that somethings are beyond your control. For example, her mother passed away the day before her high school graduation. The loss is beautifully depicted by Baddeley, who creates a two-page spread of the family living room, enveloped in golden tones as father and daughter mourn together on a sofa. The only other color present is a vivid blue seen in the background of a photo of Ginsburg’s mother, her father’s tie, and her dress. In the window behind the sofa, framed with a curtain, a sketchy drawing of new graduates serves as a reminder of Ginsburg’s private pain and isolation from her classmates. She leaves for college three months later, as she knows her mother would have wanted. At college Ginsburg meets her future husband Martin Ginsburg. They are like-minded where it matters and decide to marry and attend law school together. Their inspiring relationship dynamic is captured in an image of the family, after the birth of their first child: Martin Ginsburg holds the baby, Jane, as Ruth Ginsburg sits next to him studying law. Their relationship is subtly but consistently portrayed as a partnership, and their roles push against stereotypes, as it is Martin Ginsburg most often depicted in nurturing roles serving dinner and cuddling babies. Levy does a brilliant job integrating the multiple, sometimes intersecting, experiences of oppression Ginsburg experienced, whether because of religion or gender. For instance, in a law school class of 500 Ginsburg was one of 9 women. And, although the brilliant Ginsburg tied for first in her law school class, she found getting hired difficult; men were not comfortable working with women, prejudice against Jews was still prevalent, and potential employers thought a working mother couldn’t commit to her job, a phenomenon still affecting women through maternal profiling and caregiver discrimination. But, as the bold white typography insists “she resisted and persisted.” Ginsburg became one of the few women law professors in the US while raising two children. Even more, she argued many cases before the Supreme Court in her fight for equality, and in 1993 was asked, by President Bill Clinton, to be a justice on the Supreme Court. Baddeley’s realistic background and detailed character drawings, along with the bold typography that serves as a constant refrain of dissent, all come together with Levy’s words to build an accessible story about identifying what is right and demanding change. Levy created a thorough biography that doesn’t get bogged down in too much detail, but instead maintains resistance as a unifying thread. I highly recommend this empowering story of an impressive but so very human woman who demanded the life her mother helped her imagine but wasn’t satisfied living it alone. Ginsburg demanded laws making it easier for the rest of us to defy gender expectations and constraints. Wonderful read about an important woman in US law and politics.